"Mother of Mercy, Teacher of hidden and silent sacrifice, to you, who come to meet us sinners, we dedicate on this day all our being and all our love. We also dedicate to you our life, our work, our joys, our infirmities and our sorrows. Grant peace, justice and prosperity to our peoples; for we entrust to your care all that we have and all that we are, our Lady and Mother. We wish to be entirely yours and to walk with you along the way of complete faithfulness to Jesus Christ in His Church; hold us always with your loving hand." Don't forget St John the Evangelist!!! You forgot St John of the Cross! (His feast day is my birthday) Silly you. You definitely love your Mama Mary! Thanks, as always for being the resource of all things Catholic, Nick!! How's that new little blessing? Nick, have you seen the latest research on the reflections in her eyes? 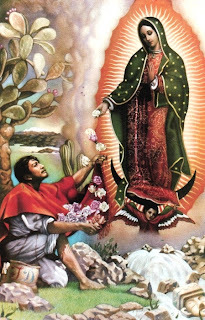 Through technology only available in the last 5 years or so, they have been able to make out who was with Juan Diego in his audience with the Bishop in which he showed his tilma and revealed the image of Our Lady of Guadalupe. According to one scientist's account, he can make out the bishop, the interpreter, and some lay faithful. Pretty amazing stuff.